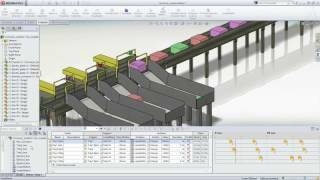 SOLIDWORKS Simulation Professional gives product engineers the efficiency to evaluate structural product performance under a wide range of physical scenarios using the powerful virtual testing environment of SOLIDWORKS Simulation Professional. 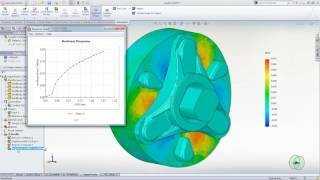 Fully embedded with SOLIDWORKS 3D CAD, SOLIDWORKS Simulation Professional enables engineers to determine product mechanical resistance, product durability, natural frequencies, and test heat transfer and buckling instabilities. Fatigue Analysis Fatigue analysis examines how repeated or random load cycles can cause structural failure (so called metal fatigue). SOLIDWORKS Simulation enables designers to take two, complementary approaches to design analysis: (1) Design for Strength and (2) Design for Life. Thermal structural analysis is the application of the finite element method to calculate the temperature distribution within a solid structure, which is due to the thermal inputs (heat loads), outputs (heat loss), and thermal barriers (thermal contact resistance) in your design. Thermal structural analysis solves the conjugate heat transfer problem with the simulation calculation of thermal conduction, convection, and radiation. 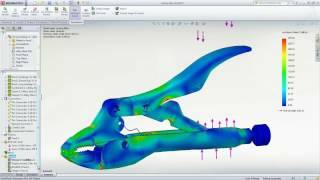 Structural simulation covers a wide range of FEA problems – from the performance of a part under a constant load to the stress analysis of a moving assembly under dynamic loading, all of which can be determined using SOLIDWORKS Simulation tools. 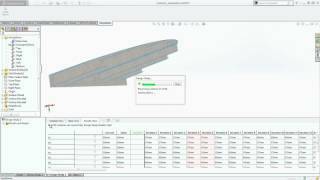 SOLIDWORKS Simulation simplifies structural optimization with a goal-driven design approach to parametrically alter a design so that it meets defined structural goals. In a drop test analysis, the time varying stresses and deformations due to an initial impact of the product with a rigid or flexible planar surface (the floor) are calculated. As the product deforms, secondary internal and external impacts are also calculated, locating critical weaknesses or failure points, as well as stresses and displacements. 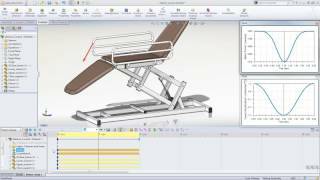 Drop test analysis using SOLIDWORKS Simulation enables you to visualize the elastic stress wave propagating through the system so that the correct assembly methods are used. 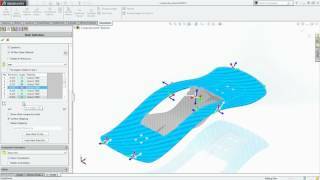 Quickly and efficiently investigate the natural frequencies of a design—with and without loads and boundary conditions – with easy-to-use SOLIDWORKS Simulation. Ensure that the natural modes of vibration are away from environmental forcing frequencies, indicating that the design will meet the required service life.